Oil prices fall in line with another decline across global stock markets on concern about a U.S. government shutdown and a worsening world economy. US crude drops below $43 a barrel for the first time since June 2017. Investors flock to perceived safe-haven assets such as gold and government debt, at the expense of crude oil and stocks. U.S. crude plunged nearly 7 percent on Monday, hitting its lowest levels in a year and half, as the oil market fell in tandem with equities amid deepening turmoil in Washington DC. The Dow Jones Industrial Average plummeted more than 600 points, while the S&P 500 closed in bear market territory. Both stock indexes were buffeted by headlines out of Washington, including a government shutdown and President Donald Trump's reported desire to fire Federal Reserve chair Jerome Powell over the central bank's interest rate increases. The selling in global risk assets on Christmas Eve deepened a nearly three-month slide in oil prices. From peak to trough, U.S. crude has fallen nearly 45 percent from its 52-week high at the start of October. Brent has fallen as much as 42 percent over the same period. "For now, there's no place to hide in any of these markets. Oil's being taken down with the stock market and the negative sentiment that's sweeping across really everything, and for now the downward pressure is going to persist," John Kilduff, founding partner at energy hedge fund Again Capital told CNBC's "Closing Bell" on Friday. U.S. crude futures ended Monday's session down $3.06, or 6.7 percent, at $42.53, the lowest closing price since June 21, 2017. At the session low, WTI came within about 30 cents of U.S. crude's 2017 low at $42.05. Brent crude futures fell 6.2 percent, or $3.35, to $50.47 a barrel, hitting a 16-month low. Brent fell 11 percent last week, while U.S. crude posted its worst weekly performance in nearly three years. The fourth-quarter rout in oil markets is being fueled by concerns about growing oversupply in the market. Top producers the United States, Russia and Saudi Arabia have pumped at record levels in recent months. Meanwhile, forecasters now say demand for oil will grow more slowly than previously anticipated in 2019. Financial strain in emerging markets, rising interest rates and trade tensions are fueling fears of a slowdown in global economic growth, which would weigh on fuel consumption. OPEC and allies led by Russia agreed this month to cut oil production by 1.2 million barrels per day from January. 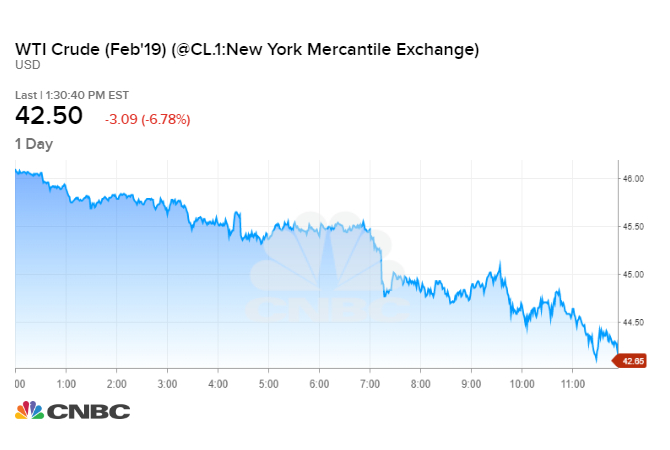 "These cuts are probably going to work but it's going to take some time for them to show up," Denton Cinquegrana, chief oil analyst at Oil Price Information Service, told "Closing Bell." "If you think about the first quarter, you have refinery maintenance going on, so there's not going to be that crude oil demand that might normally be there." The price drop has caused U.S. shale oil producers to curtail drilling plans for next year. The boom in shale output has made the United States the world's largest oil producer, overtaking Saudi Arabia and Russia.